Up and over the Daggapad, then along the railwayline. 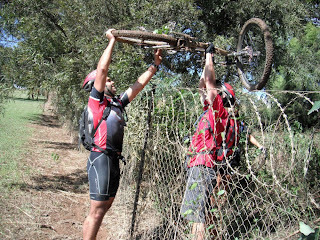 When we got back to the rivertrail, it was closed for the Impi-runners. We had to find an alternative route to get on the Greek-church climb. Nothing a bit of adventure-racing background couldn't fix. 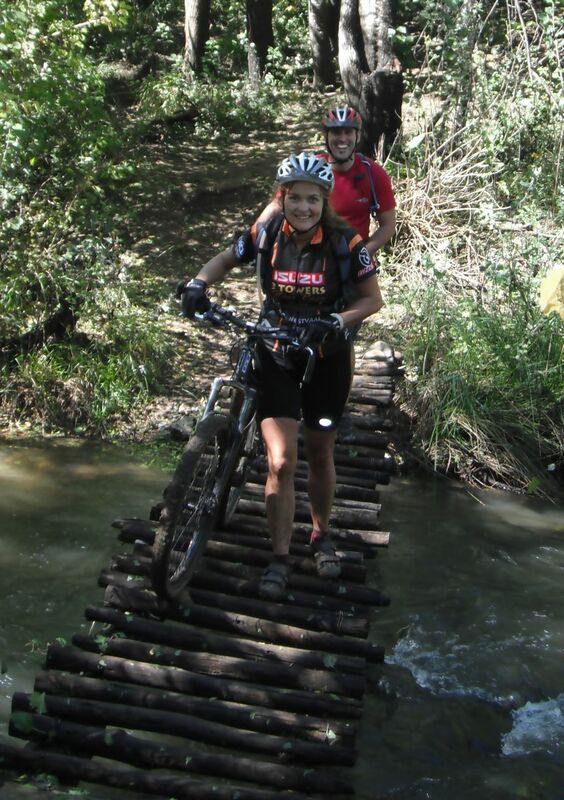 On the way down, we cycled on the Impi-spectators route, so we could get a glimpse of the fun that the runners had. Often, after a particularly cool piece of singletrack, I wonder if there's anything better in life. The absolutely best part of a Van Gaalen daggapad-ride is not getting to the top of the cement-climb. It's not bombing down the rocky first piece of singletrack dodging cow-dung, or the flowing forest-part, or the riding slowly and chatting to each other on the gravel-road. It's not chasing one another on the piece of hidden singletrack that runs far above the boring gravelroad below. Nor is it the fanta at the fanta-stop, or the railway-track on the way to more river-singletrack. It's definately not the climb up to the Greek church. although it come close, the best bit at Van Gaalens is also not the easter-egg-end-nicknaks-picnic at the Greek church, or getting a bit of air on the downhill back to the rivertrack, or the rivertrack itself, or the floating bridge, or the screams of sheer pleasure from the other riders as they enter the bush tunnels. Or the coffee-milkshake afterwards. You can't buy happiness. But you can buy a bike, and that's pretty close.